Today would have been Dorothy Whipple’s birthday – and she is the next author in Jane’s Birthday Book of Underappreciated Lady Authors. I have never read any of her books but have been curious about them for a while and I thought a good place to start might be Someone at a Distance, her 1953 novel which seems to be her most popular and which has been published both as a standard dove-grey Persephone and as a Persephone Classic. Old Mrs North responds to an advertisement in The Times – Young Frenchwoman desires to spend July, August in English home. French conversation. Light domestic duties – and soon Louise Lanier comes to stay. Louise is the daughter of a bookseller in a provincial town in France and sees coming to England as a way of escaping from the humiliation of being rejected by her lover who has recently married another woman. Bored and miserable, Louise sets her sights on Avery North and won’t be satisfied until she has caused as much trouble as possible. As I’ve said, the plot is a simple one, but Whipple’s writing and the way in which she tells the story give it the additional layers that make it such a compelling read. You can see what is going to happen almost from the start, but you don’t know exactly when or how it will happen – and when the inevitable moment comes, you feel as shocked and upset as the characters themselves. My sympathies were with Ellen; she came across as such a genuinely nice person, who really didn’t deserve the treatment she receives from Avery and Louise. I was impressed by how well she coped with the huge changes in her life…at least until an incident near the end of the book, which disappointed me slightly as I discovered that Ellen didn’t feel quite the way I would have liked her to have felt (sorry for being vague, but I’m trying to avoid too many spoilers). The reactions of the other characters – the North children, the servants, friends and neighbours, and Louise’s family in France – are also explored. In some ways their thoughts and emotions are timeless, but in others this does feel like a book of its time, for example when Anne is too ashamed to tell her teachers and friends at school about her parents’ separation because she thinks they will view her differently. As for Louise, she is a wonderful character. It would have been easy for Whipple to write her as a one-dimensional villain, who does what she does purely out of spite and nastiness, but instead she takes the time to show us Louise’s life in France and to try to explain what made her such a bitter person. There were times when I could almost, but not quite, feel sorry for Louise – although in the end it was her parents I pitied, as they were forced to come to terms with the sort of woman their daughter was. Someone at a Distance is a great book, with much more emotional depth and complexity than I expected when I first started to read. Now that I’ve been introduced to Dorothy Whipple, I’m sure I’ll be reading more of her work. It sounds like a well written novel with fully fleshed out characters. Yes, it is. Actually, the only character who didn’t seem to be fleshed out was Avery, the husband, but maybe that was intentional. I loved it too and am looking forward to reading more Dorothy Whipple books. I am soon to review The Priory, which I also liked very much. I enjoyed this one too and blogged about it years ago in my early blogging days. I intended to read more books by Whipple but so far haven’t got around to it yet. I think I’ll have to get her books from the internet. I’m turning to the internet more and more often to find the books I want to read. I’m glad you still want to read more Whipple! I lived this one, I think it is probably one of her best. Though I have loved them all. Looking forward to the next one being re-issued. I’m glad there’s a new one being reissued, although I need to catch up on all of the others first! Lots to look forward to then. Lucky you. It is! I’m looking forward to reading more. I read this seven years ago and thoroughly enjoyed it, although I don’t seem to have had much sympathy for Louise! 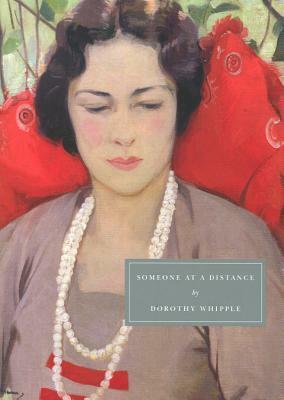 https://librofulltime.wordpress.com/2011/05/14/dorothy-whipple-someone-at-a-distance-persephone/ I have read all of Whipple’s books published by Persephone and wouldn’t hesitate to recommend every one of them. I didn’t have a lot of sympathy for Louise, but I did think it was sad that she was such a bitter, unhappy person. I’m pleased to hear you would recommend all of the Whipple Persephones! I have yet to read this books, I am so glad that you though well of it, and you have definitely inspired me to pick up my own copy soon. I loved it and am pleased that people seem to have good things to say about all of her other books as well. Now I just need to decide which one to read next. Yes, me too. I think you’ll enjoy this one. I know what you mean about being disappointed by the way Ellen felt – I assume I’m thinking of the same incident, and it made me want to shake her, but she was married for 20 years and can’t switch her feelings off just like that. I found it frustrating, but yes, after 20 years I suppose it’s realistic that she would feel like that. Definitely a great place to start with Dorothy Whipple! I’ve read most of them and I also loved The Priory and Because of the Lockwoods. Her short stories are good also. Yes, I think I chose a good book to start with! I’m looking forward to reading her others, including The Priory and Because of the Lockwoods.